In this image taken from NASA Television, the SpaceX Dragon cargo spacecraft approaches the robotic arm for docking to the International Space Station, Saturday, Dec. 8, 2018. SpaceX delivery full of Christmas goodies has arrived at the International Space Station. The Dragon capsule pulled up at the orbiting lab Saturday, three days after launching from Cape Canaveral, Florida. 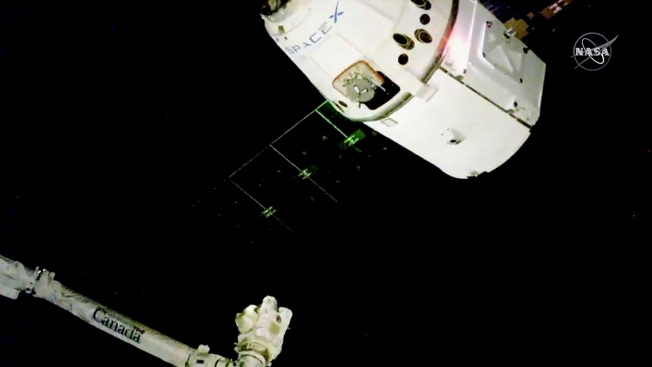 It took two tries to get the Dragon close enough to be captured by the space station's robot arm. The hour-and-a-half delay was caused by trouble with the communication network that serves the space station.